Taking increments of 8, this is our second round. For more information you can check out my teacher at MarthaLangWescott.com. She also has copies of “Mechanics of the Future” a great start up reference book for the asteroids. Apollo: Slow learner, the area of our life where we can feel stuck, where we keep repeating the problems. The glyph is a circle with a hat on it. Astraea: Unending, never over, Closure. Eyes are also associated with Astraea, and what is seen or witnessed. The glyph is a percentage sign. Circe: The desire to help. Being supportive. That support at the 11th hour can be associated with Circe. The glyph is a letter C with two lines running through it from top to bottom. Hidalgo: The modification of information, the filtering system, not being able to speak out or speak, exhibiting convictions. The glyph is an upside question mark with a hat on top. Isis: Pieces and the ability to put the pieces in order. Scattered, pieces and the need to put it all together. The glyph is a capital letter I with a circle from top to bottom. Kassandra: The ability to accept and follow advice. Advising others, Listening is important. Ears are associated here. The glyph looks like (according to my teacher) hand cupping an ear with the receptivity from the outside. 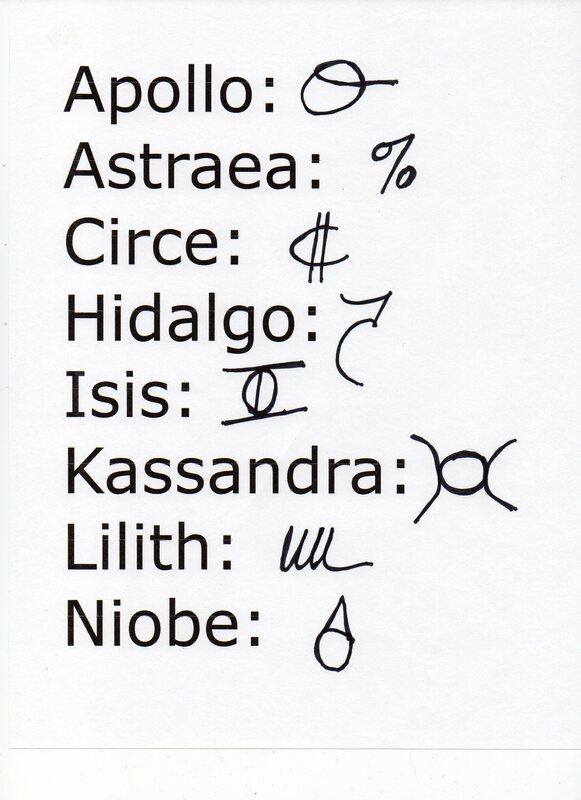 Lilith: Decisions, triangles and competitive situations. Rejection and selection. Gender issues and stereotypes. My teacher refers to the glyph as an upturned palm. Niobe: The perils of pride, pride in children or fertility where hard lessons can be learned through too much pride. The glyph is a circle (represents circle of pride) inside of a teardrop.